Dzong-ka-ba's (1357-1419) The Essence of Eloquence is the one book on wisdom that the Dalai Lama carries with him wherever he goes. Composed by Tibet's great yogi-scholar and founder of the Ge-luk-ba school, it stands as a landmark in Buddhist philosophy. In this first of a three-volume series, Jeffrey Hopkins focuses on how the conflict between appearance and reality is presented in the Mind-Only, or Yogic Practice, School. The Essence of Eloquence is so rich that for the last six centuries numerous Tibetan and Mongolian scholars have been drawn into a dynamic process of both finding and creating consistency in Dzong-ka-ba's often terse and cryptic tract. Hopkins makes extensive use of these commentaries to annotate the translation. Included are historical and doctrinal introductions and a critical edition of the text, as well as a lengthy synopsis to aid the general reader. Specialists and nonspecialists alike will find this important book indispensable. This book is the first of a three-volume series of related but stand-alone works on the first two sections of Dzong-ka-ba's The Essence of Eloquence. 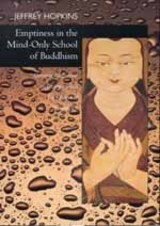 The focus of all three volumes is the exposition of emptiness in the Mind-Only School according to numerous Tibetan and Mongolian scholars over the last six centuries who have tried both to find and to create consistency in his often terse and cryptic tract. Jeffrey Hopkins is Professor of Tibetan and Buddhist Studies at the University of Virginia. Former Chief English Interpreter to the Dalai Lama, he is the author of numerous articles and twenty-seven books, including Meditation on Emptiness (1983) and Emptiness Yoga (1985), and is translator/editor for the Dalai Lama's How to Practice: The Way to a Meaningful Life (2002) and Advice on Dying: And on Living a Better Life (2002).